Edward S. Neusel, son of Alex and Margaret Neusel, began his ball playing days around the time of the First World War on the sandlots of St. Louis, and at Christian Brothers College High School. His older brother Ray signed with the Burlington Pathfinders of the Central Association in 1914, and later played for Waterloo in the same league and Houston of the Texas League. Ray Neusel then served with the Navy in 1918 and played for the Great Lakes ball team. Back from military service in 1919, he was with the Chattanooga Lookouts of the Southern Association, while 18-year-old Ed was attracting attention from major league scouts. 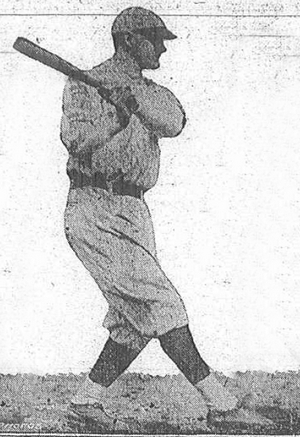 Ed Neusel was signed by the Winston-Salem Twins of the Class D Piedmont League in 1920, where he hit .237 in 21 games, before batting .213 in 101 games with the Chickasha Chicks of the Class D Western Association. Meanwhile, Ray was with the New Orleans Pelicans of the Southern Association but decided to jump to the independent Delta League. Regretting his decision after a few days, he sought reinstatement with the Pelicans but was not allowed to return. In the spring of 1921, Ed Neusel was looking forward to playing with the Coffeyville Refiners of the newly formed Class D Southwestern League. Ray - still suspended from play in Organized Baseball - had signed to play with an industrial team in Kenosha, Wisconsin. On March 8, 1921, the day before he was to leave for Kenosha, Ray and fellow ballplayer Jimmy Brannigan, were driving through St. Louis when they were stopped by several men in another automobile. Threats were made and Ray Neusel started to run across the street. He ran headlong into a street car and died the following day. Ed Neusel joined Coffeyville following his brother's funeral and had a career-year batting .327 in 92 games, which prompted a sale to the New York Yankees. Joining the Yankees spring training camp in New Orleans in March 1922, Neusel showed "all the earmarks of a youngster ripe for fast company," according to the Brooklyn Daily Eagle. "His fielding is good and he can smite the pellet with a vengeance." On March 15, playing for the rookies against the Yankees regulars, Neusel impressed everyone with an inside-the-park home run, a single and two walks. However, on March 26, he was released by the American League club and joined the Waterbury Brasscos of the Class A Eastern League. He also played for the Albany Senators of the same league and finished out the season back with Coffeyville. Neusel played 68 games in the Eastern League that year, and batted .263, while playing 47 games for Coffeyville and batting .335. Neusel was recalled by the Yankees in late September 1922, although he was not required to report to manager Miller Huggins that season. He was released to Nashville on February 1, 1923, and instead of reporting to the Southern Association club, the 21-year-old retired from the game and returned home to St. Louis, where he operated a tavern for many years. He later worked in the catering business, was secretary and treasurer of the Licensed Liquor Dealers' Association, and sought public office in St. Louis in 1934. He later became secretary of the Bartenders Union and, in August 1940, acting on information from an anonymous person who declared an attempt would be made to kill Neusel, police detectives searched for Neusel for almost three hours before finding him at the baseball game at Sportsman's Park. In October 1942, at the age of 41, Neusel joined the Navy and was stationed at Lambert Field in St. Louis. On July 31, 1944, Seaman Neusel died of heart disease at his sister's home in St. Louis. He is buried at the Calvary Cemetery in St. Louis. Thanks to Astrid van Erp, for help with photos for this biography.